​​​ FRISCO – Two new North Texas communities will bring more than 500 homes to one of the Dallas-area's hottest housing markets. Developer Green Brick Partners recently received final zoning approvals for its Park Vista community at Eldorado Pkwy. and Coit Rd. The Park Vista community will include more than 300 homes and almost seven acres of open space in four small parks. Homes in the development are planned in a combination of Georgian, Craftsman and Colonial styles. 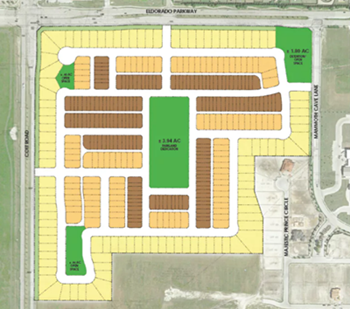 Green Brick's Northwood community on Panther Creek Pkwy., which will have 168 homes, also received Frisco planning approvals to begin construction.